As we passed over the Mississippi River into Memphis, TN and glanced our first view of Bass Pro Shops Pyramid, the awe in the backseat was audible. The wild child cheered with excitement as the oldest little immediately pointed out the giant pyramid looming before us. “Mom, Mom, look! What is that place? !” Oh what I would give to have captured the way her eyes lit up when I said we were going there. Originally built in 1991 as a sports arena, The Memphis Pyramid has been home to the Bass Pro Shops megastore since 2004. Housing a cypress swamp with 100-foot-trees, an 84,000 gallon alligator habitat, a full nautical themed restaurant complete with a saltwater aquarium, and a 13-lane ocean themed bowling alley, it is obvious this venue is so much more than “just a store”. Stretching across approximately 1250 square feet, the Beretta Fine Gun Gallery in Bass Pro Shops Pyramid is the third in the United States. They sell premium and gallery grade firearms, shotguns for hunting and sporting, and pistols ranging from pocket-size to full-size. Inside of the Beretta Gallery, visitors can also find high quality hunting gear, accessories, home décor, and gifts for both men and women. Our favorite piece of the experience was exploring The Lookout. Arriving at the top of the 32-story steel Pyramid via a fully glass elevator was incredible. Those views; simply breathtaking. Standing on the cantilevering glass floors, staring out over the city of Memphis, it was hard not to feel inconsequential. The beauty of the mighty Mississippi set against the ruggedness of the steel bridges and the vastness of the looming storm clouds was almost overwhelming. Arcade Shooting Gallery: Designed in a natural wildlife setting, this allows children to have fun shooting at targets and moving objects. Archery Range & Pistol Range: A 25-yard live fire range for practicing both archery and pistol shooting available during specified times. Call ahead for details. Big Cypress Lodge: A unique 103 room hotel suspended into the hundred foot cypress trees planted within Bass Pro Shops Pyramid. Special Events: Various special events take place throughout the year including a Spring Fishing Classic, Labor Event Family Fun Weekend, Halloween Bass Pro Style, and Santa’s Wonderland. 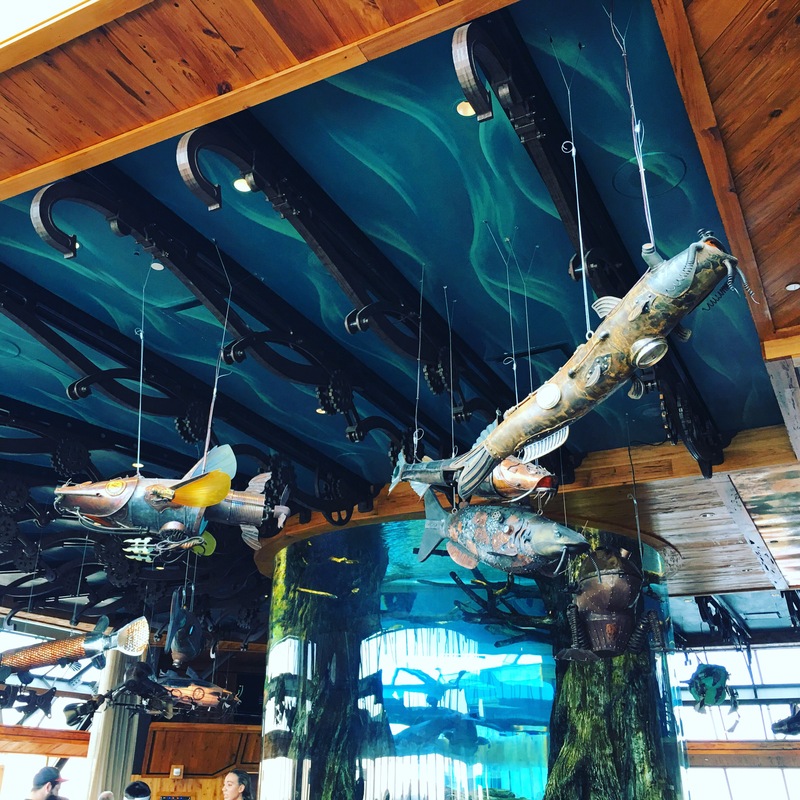 Uncle Buck’s Fishbowl & Grill: A 13-lane ocean-themed bowling alley with a nautical-themed restaurant and bar, saltwater aquarium, and separate island-themed bar.